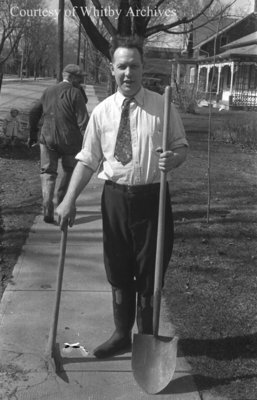 A black and white negative of Cecil Greenfield standing on a sidewalk and holding a shovel and pickaxe. The tools will be used to clean out a sewer main blockage that occurred on April 23. No specific year was given. Spring Sewer Main Cleanup, c.1938, Marjorie Ruddy. Whitby Archives A2013_040_730C.